Enlighten helps clear damp and heat from the veins. 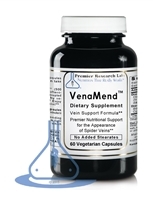 It helps reduce vein inflammation and infections. Blood Tonic is also required to improve blood circulation. If there is clot formation, Nova is also required to resolve thrombosis. The key ingredient of Invisi-Vein is the powerful citrus bioflavonoid compounds, diosmin and hesperidin, naturally occurring flavonoids. Advanced circulatory support for toning venal walls and diminishing spider veins for maximum capillary protection and skin rejuvenation – so you can enjoy healthy, smooth-looking legs again!